Cats are just so . . . so . . . well, I don't know what they are, but whatever it is, they excel at it. Our cats, Rika and Keiko, get along about as well as you might expect for an arthritic senior citizen (Rika) and an exuberant teenager (Keiko). Rika tolerates Keiko for a while, then hisses at her and bites her whenever Keiko oversteps Rika's boundaries. 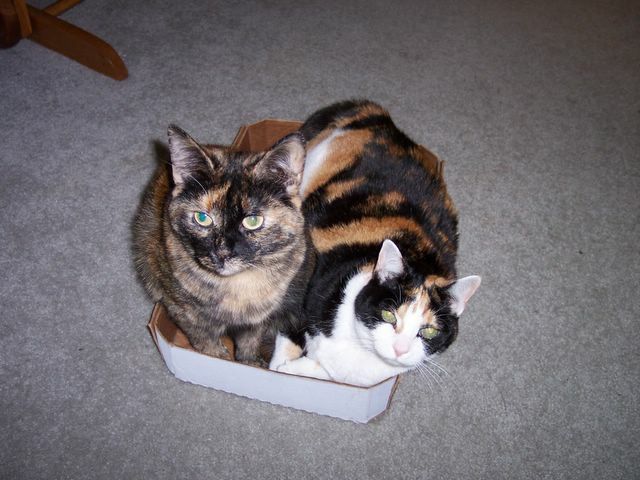 Rika and Keiko like to sit in boxes, and since they couldn't share one nicely, we had to provide two for them. Of course, having two boxes doesn't really help. Whichever box one is in, that's the one the other wants. So Brigid just got home from school and told me to come upstairs from my dungeon office, "quickly but don't scare the cats!" Here, for your viewing pleasure, Rika and Keiko. 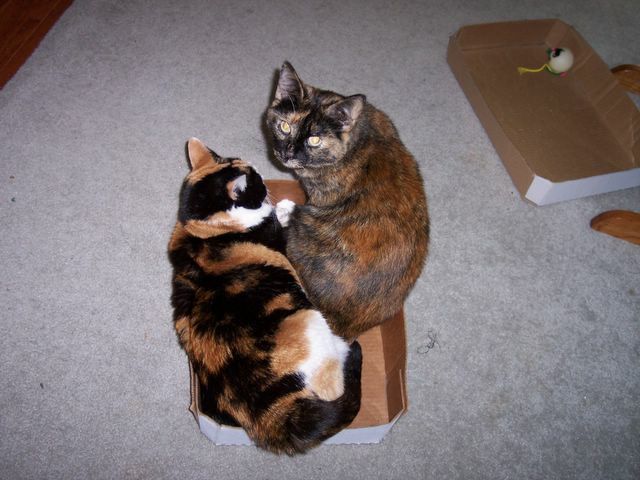 Keiko (on the right) says, "I was here first, but Rika just plopped herself right in like she owns the place! Brigid said I should image-edit this one to make it look like they were left on our front porch like this! I love your cats. I have one almost exactly like the very calico, 'cept mine was born with no tail. Her name is Billie Jean. My nephew named her when he was 4 yrs old. Actually, it's his cat, but his little brother has severe allergies, i took the cat in so they wouldn't have to give her to a stranger and wonder if she's being taken care of properly. The one on the left (in the second picture) looks a lot like a kitten I had. We named her Tobo (short for Toilet Bowl) because she would come running into the bathroom every time we flushed the toilet so she could watch the water swirl around.